The eighth recipe in the Modern Baker Challenge is Real Welsh Scones. This was a wonderfully simple recipe, and even a sleepyhead like me found it easy to mix these up for breakfast on a Sunday morning. 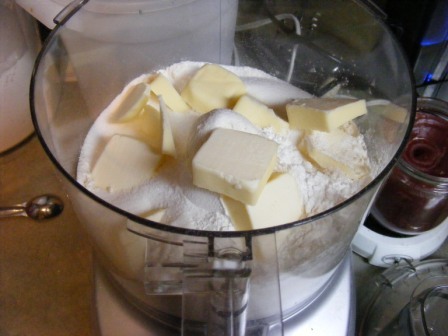 First, I placed all the dry ingredients in the food processor and added cold butter. I pulsed the mixture about eight to 10 times, until it resembled a fine powder. 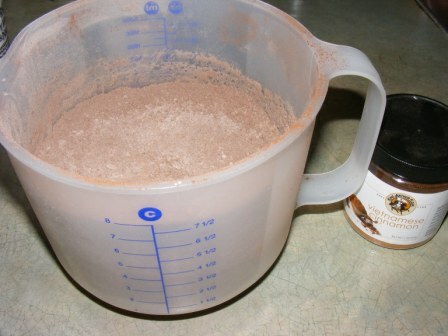 After beating the egg and milk together, I added them to the dry mixture in a bowl and stirred it all together. 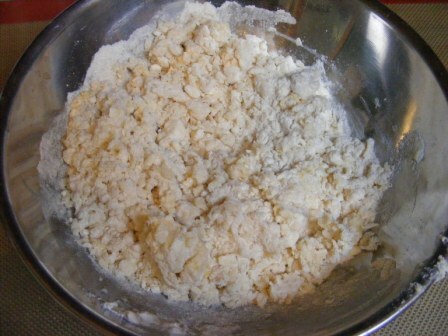 I kneaded the dough a few times to incorporate all the flour and mix in the butter pieces. The dough was a little crumbly but held together OK as I divided it into two pieces, patted them into rounds, and scored them with a dough scraper. I cut into one and found it to be a bit underdone. The scones were nicely browned, and I was worried that if I continued to bake them, they would get overdone on the outside. Since I had already turned off the oven, I put the scones back in and baked them using the residual heat. 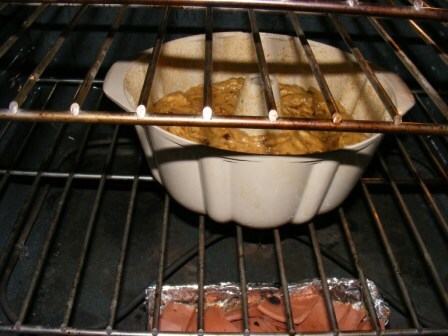 This is a technique known as baking in a “reducing oven”. Often this is done by preheating the oven to a high temperature, say 500 degrees, then reducing the temperature to 450 or so when you put the bread in the oven. In my case, the oven was turned off, and I baked the scones for about five more minutes, at which point they were perfectly baked. The finished scones were delicious. They had a slight sweetness from the sugar, and they were perfect with a little marmalade and a cup of coffee. This is yet another great recipe from The Modern Baker. 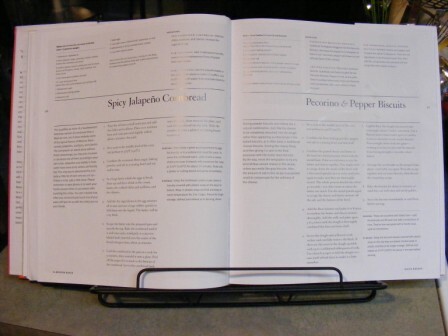 I know that all cookbooks have some recipes that are better than others, and even the best of them have a few recipes that not everyone will like. But so far, I have loved everything I’ve made from this book. And so have my family and friends. Although I have for the most part been baking the Modern Baker Challenge quick breads in order, I did a little jumping around this weekend. First, I had some fresh blueberries that I got at the market and wanted to use while they were still fresh, so I baked blueberry crumb muffins for breakfast this morning. Then, although I was planning on making the next recipe — apple raisin bread — this afternoon, I decided I really wanted cornbread for dinner tonight. And since I only had two eggs left in the fridge, the apple raisin bread would have to wait. Check out my nifty new cookbook stand. I decided that I would try to keep The Modern Baker in better shape than The Bread Baker’s Apprentice during the Challenge. My wife saw the stand and thought it would make a nice holder for her iPad, but I convinced her otherwise, so it found its way to the kitchen and will hopefully help me keep TMB in good shape. 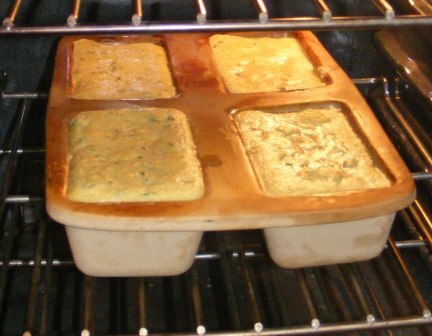 I decided to bake the spicy jalapeño cornbread in four mini loaf pans instead of one large loaf. 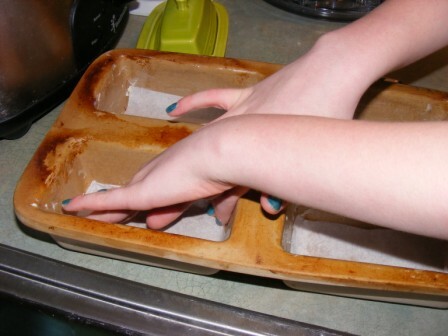 My daughter prepared the pans by buttering them then lining the bottoms with parchment paper. 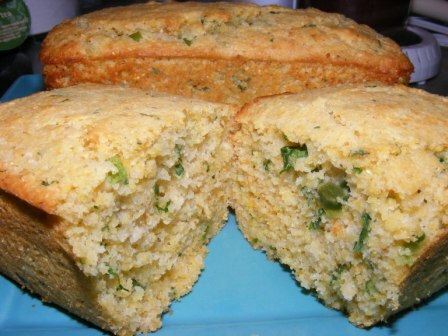 The spicy jalapeño cornbread recipe calls for four jalapeños, but I decided to use three, as I didn’t want it to be too spicy for my family to enjoy. 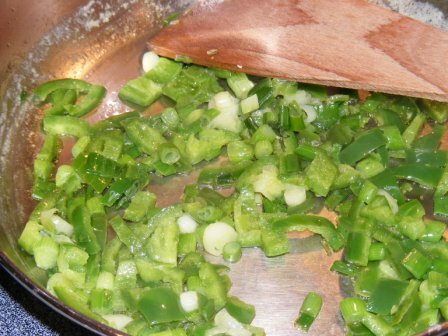 I started by chopping the scallions, then I put on rubber gloves and split, seeded, and chopped the jalapeños. The recipe calls for a stick of melted butter, so I melted it in the sauté pan, poured it into a bowl, and used the same pan to soften the scallions and jalapeños without the need for additional oil. I mixed the dry ingredients — cornmeal, flour, sugar, baking powder, salt, and, in my case, buttermilk powder — in a bowl and set it aside. In another bowl, I beat the eggs, then added water (in place of the milk), and whisked in the butter, cilantro, and the sautéed chilis and scallions. Finally, I folded in the dry ingredients. The batter fit perfectly into the mini loaf pans, which went into the oven next to the chicken breasts we were cooking for dinner. The oven was set at 350° for the chicken, so I figured I would watch the loaves rather than trying to time them. As it was, they took about 25 minutes to bake. We served the cornbread fresh out of the oven for dinner. 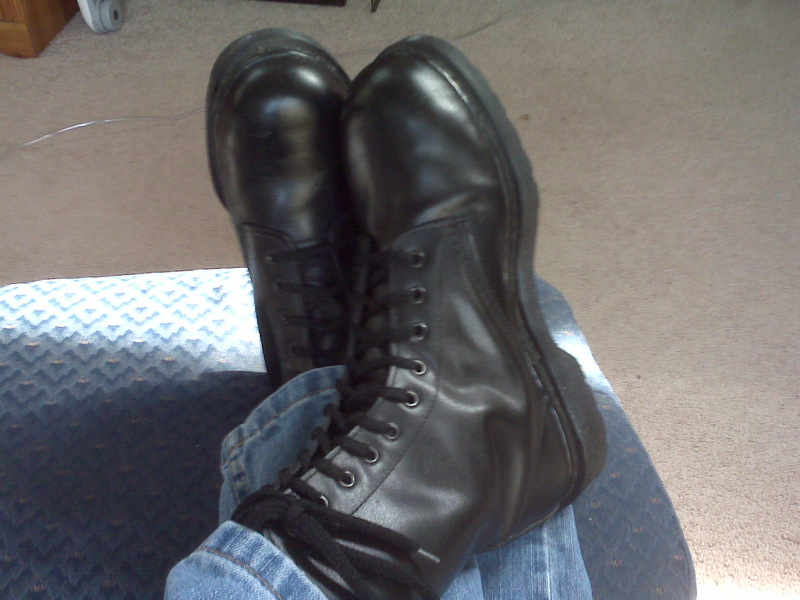 I needn’t have worried about it being too hot. It had a lot of flavor from the cilantro, scallions, and jalapeños, but it wasn’t overly spicy. This was another great recipe from a great book. So far, I haven’t been disappointed with any of the recipes I’ve tried. And this is another one I will definitely make again. I love recipes that move me out of my comfort zone. I don’t view a recipe with unfamiliar techniques or unusual ingredients as something to fear. Rather, I see it as a chance to expand my experience as a chef. When I first looked at the recipe for Date Walnut Bread, the fourth bread in the Modern Baker Challenge, I wasn’t disappointed, as it looked like another tasty recipe. But it also didn’t seem to offer anything unusual in the way of ingredients or techniques. That is, until I looked at the directions for preparing the pan. 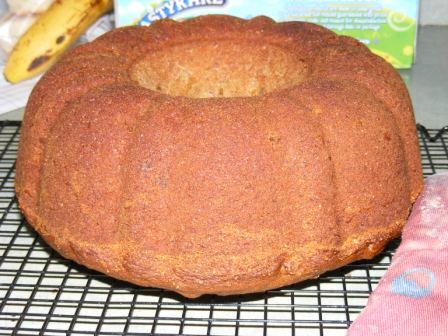 This bread is baked in a Bundt pan. First, you butter the pan, which in itself is not at all unusual. 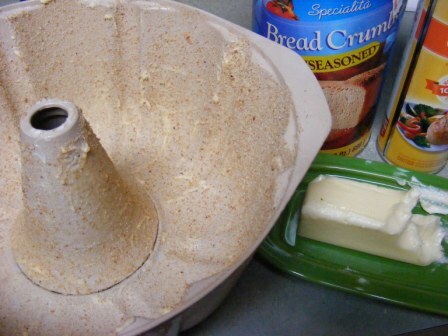 The next step — which I have never heard of for prepping a pan for baking — is to dust the pan with bread crumbs. And, as if that weren’t enough, the pan is finally sprayed with vegetable cooking spray. OK, maybe I’m easily excited, but I thought this was kind of cool. As with the other recipes in the Quick Bread section of The Modern Baker, once my mise en place was done, the batter came together really fast. As I was preparing the dates, which were placed in a bowl with butter and boiling water, I noticed that the dates I had purchased had sugar added. I compensated for this by cutting the sugar added to the recipe by 1/2 cup. The directions call for mixing the batter by hand, first with a whisk, then by folding with a rubber spatula. Although I love my Kitchen Aid mixer, and in fact used it for almost all of the breads in the BBA Challenge, I have enjoyed mixing most of the Quick Breads by hand. After beating the eggs, I whisked in the sugar and vanilla. Next, I folded in the dates, butter, and water. 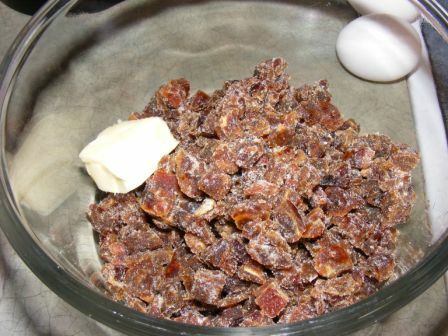 Finally, I stirred in the flour, baking soda, and salt, and added the walnuts. The batter was thick, gooey, and smelled delicious. It reminded me of caramel or butterscotch. OK, it’s time for an admission. Some of you may find what is to follow rather disturbing and may wish to skip to the next paragraph. Those of you who choose to read it: you’ve been warned. I’m a batter eater. Yup, it doesn’t matter to me if it has raw eggs in it — I always taste cake and bread batters. I’ve always done it, and always will. I even let my kids do it. My older, more cautious daughter often declines if the batter has eggs in it. 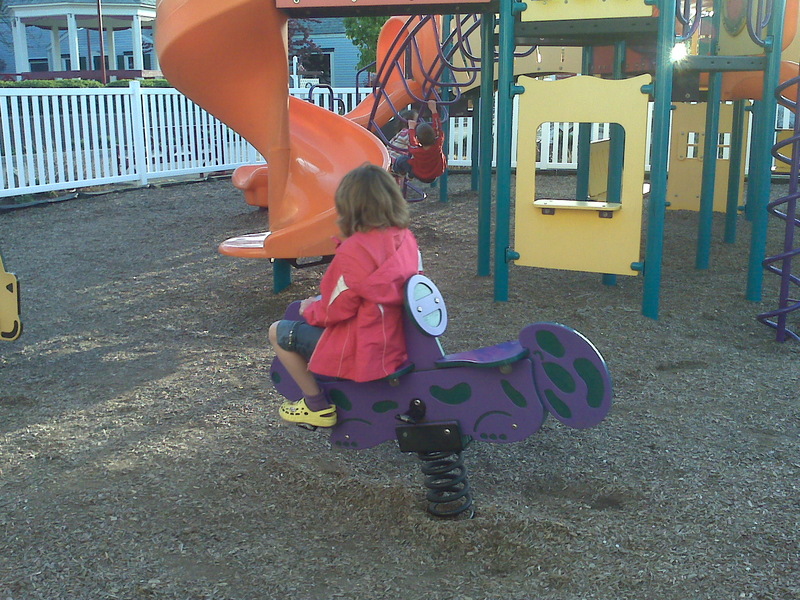 But my younger daughter, the risk taker of the clan, dives in with reckless abandon. The girls weren’t around when I made this bread, so I had to enjoy the batter by myself. And enjoy it I did. It was rich but not too sweet, with a chewy texture from the dates. And it smelled so good, there was no chance I was going to wait until it cooled to try it. This bread did not disappoint. It was simple enough to throw together after work. And delicious enough to want to make again and again. Whole Wheat Currant Bread is the third quick bread in the Modern Baker Challenge. 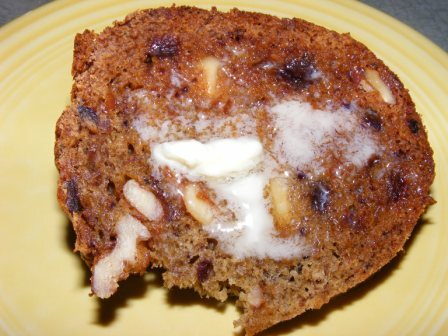 When I think of quick bread, what comes to mind is something sweet and flavorful, more like a cake than a bread. Pumpkin bread, banana bread, blueberry bread — these are all my quick bread ideals. So I must admit that I wasn’t all that excited to make this bread. 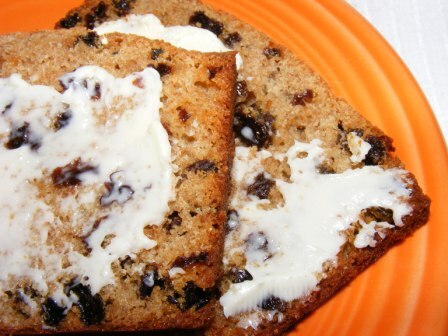 It’s loaded with currants — and while I have nothing against currants per se, I had never actually baked with them before, and they just seem so healthy and, I don’t know, British. But the real problem I had with this bread is that it is made with whole wheat flour. And not just some whole wheat flour, but 100% whole wheat flour. That’s right — it’s all whole wheat; not an ounce of AP or bread flour to be found. Again, I have no particular objection to whole wheat flour — I bake a lot of breads with at least some whole grain in them and love the complexity it adds to the flavor — but 100% whole wheat quick bread? I just couldn’t see why I would want to bake, let alone eat that. But I have committed myself to baking every recipe in The Modern Baker in order, so, like it or not, I cold hardly stall out on the third bread. I began by assembling my ingredients. Although I’m a big proponent of using mise en place, I don’t always do a full mise for all my recipes. At the very least, though, I get out all of the ingredients so they are all at hand and I am certain that I am not missing anything. As with many of Nick Malgieri‘s quick breads, the list of ingredients in Whole Wheat Currant Bread isn’t really all that long. 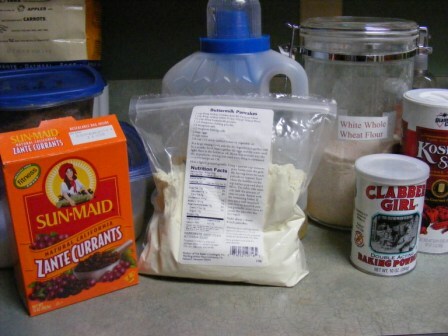 Other than the whole wheat flour and currants, there is sugar, baking powder, salt, eggs, oil, and milk or buttermilk. As with most recipes calling for buttermilk, I used dry buttermilk powder and water. 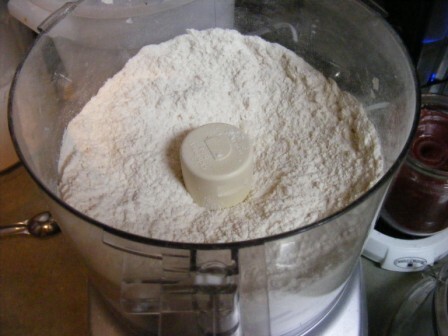 I love the flavor of buttermilk but rarely keep in on hand, so I almost always have buttermilk powder in the cupboard. 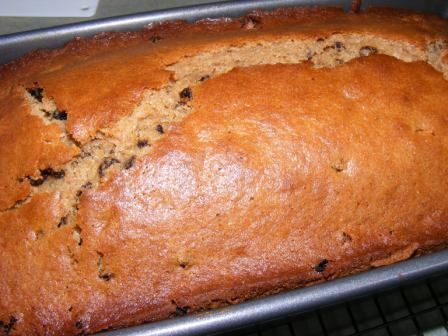 The batter came together very fast — it is a quick bread, after all. I didn’t time myself, but I would guess that the time between assembling the ingredients and putting the loaf in the oven couldn’t have been more than 10 minutes. I baked the loaf at 350° F for 50 minutes, until a knife inserted near the center of the loaf came out clean. While the loaf was baking, I began to wonder if perhaps I had been too quick to judge this bread. It smelled really good in the oven, and when I took it out, I found I didn’t want to wait for it to cool before slicing into it. But wait I did, at least for a while. 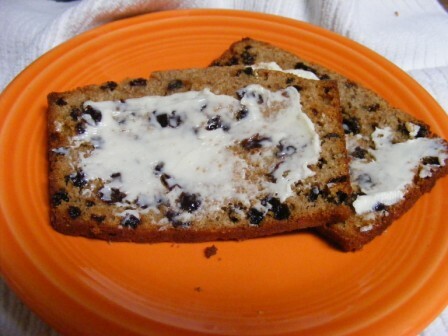 When I finally sliced into the bread, it was still a bit warm and was loaded with currants. It still smelled divine, and I decided to try it with a little smear of salted butter. So, how was it? Did the complexity of the whole wheat and the sweetness of the currants overcome my skepticism and make a believer out of me? In a word — YES!!! This bread was absolutely delicious. It didn’t have the grainy texture, density, and mealy flavor that whole wheat breads sometimes have. The robust flavor of the whole wheat was perfectly matched by the sweetness of the currants. My family and several co-workers with whom I shared this bread all agreed: this recipe is definitely a keeper. The seventh recipe in the Modern Baker Challenge (and the second quick bread I agreed to post) is Pecorino & Pepper Biscuits. 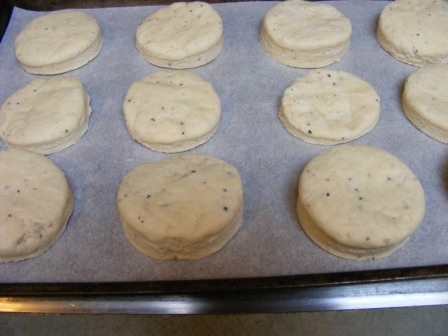 I love biscuits, and I love savory recipes with cheese and pepper, so I was looking forward to trying this recipe. But I was a little nervous, too. 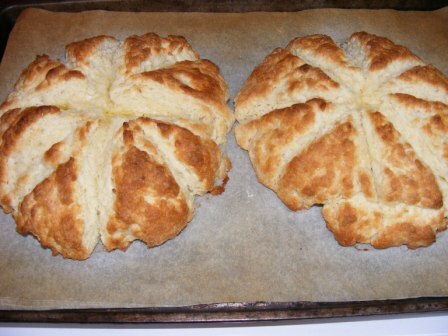 I’ve never had huge success with biscuits, pie crusts, or other things that are supposed to come out light and flaky. But as I’ve noted elsewhere, taking on recipes I have never tried or never made successfully was a big part of my motivation in taking on this challenge. Although I’ve been baking the quick breads in order, I decided to skip ahead a few pages to make these biscuits for dinner this evening. This recipe has only seven ingredients, all of which I had on hand: Pecorino Romano cheese, AP flour, baking soda, salt, black pepper, unsalted butter, and buttermilk (I used dry buttermilk powder, which I keep in the cupboard all the time). Most of these are staple ingredients in my kitchen. I don’t always have Pecorino Romano on hand, but I happened to have some left over from when I made the Roasted Onion and Asiago Miche for the BBA Challenge. 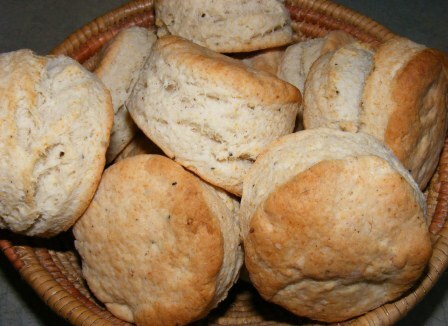 As with the other quick breads, these biscuits came together really fast. I mixed the flour, baking powder, salt, pepper, and buttermilk powder in a bowl. I pulsed the cheese and butter in the food processor a few times, added the flour mixture, pulsed it a few more times, then finally added the water and pulsed until the dough came together. I dumped the dough out onto a Silpat with a little flour on it, kneaded it a few times, and pressed it out to a thickness of about 1/2 inch. 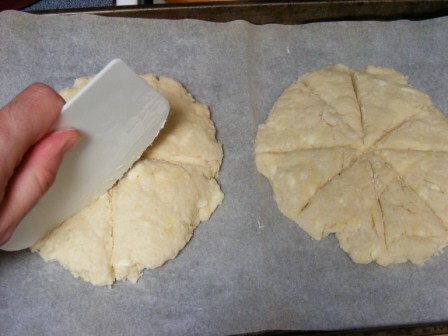 I cut the dough into 2 1/4-inch circles, which I put on a cookie sheet lined with parchment paper. 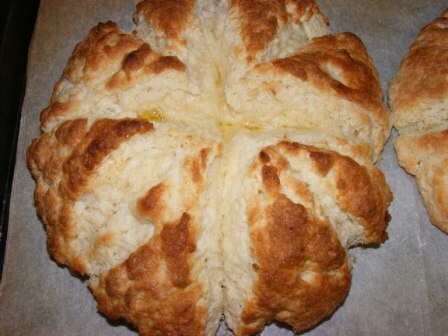 One trick I learned from this recipe is that when you cut biscuits, you should press straight down. If you twist your cutter — as I always have in the past — the biscuits won’t have nice straight sides. I baked the biscuits for 20 minutes (I think they should have come out at about 18 minutes) and served them with butter for dinner, along with oven baked chicken and green beans. These biscuits were a bit hit. They were light, flaky and oh-so-flavorful. I wasn’t sure if the kids would like the strong flavor of the Pecorino and the bite of the pepper, but they gobbled them up. 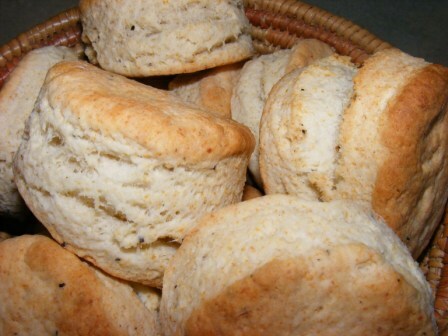 These biscuits took about 30 minutes from pantry to table, so they are easy enough to make anytime. And Nick Malgieri offers four variations, making this a great go-to recipe you can (and will want to) make often to go with dinner. 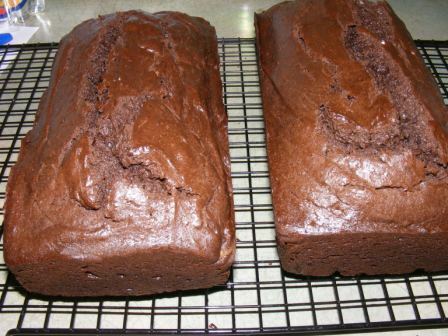 The second recipe in the Modern Baker Challenge is Chocolate Spice Bread. I was so excited to try this recipe, with its promise of ultra-chocolaty goodness, that I baked it on the first official day of the Challenge. (I made Fennel Fig & Almond Bread a few weeks ago as a “test run” of the book.) I doubled the recipe, as one loaf hardly seemed worth the effort. This bread was not what I expected. It has Dutch cocoa, white and dark brown sugars, and lots of spices (cinnamon, nutmeg, and ginger). With all of that, I really was anticipating something akin to a dark chocolate cake. In fact, the batter looked a lot like fudge brownie batter. So I was surprised, though not at all disappointed, with the result. But more on that in a minute. 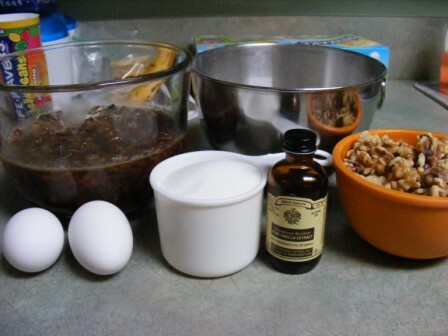 I began by mixing the dry ingredients — flour, cocoa, baking powder, salt, and the spices. An order from King Arthur had just arrived the day before, and I was excited to try my new Vietnamese cinnamon. If you have never tried it, you really should. It’s like super-concentrated cinnamon and smells so good, I just want to eat it right out of the jar. Next, I beat the eggs, then whisked in the sugars, butter, and sour cream, and finally stirred in the dry ingredients. This was one of those rare bread recipes for which I didn’t break out the Kitchen Aid. Even doubled, it was really easy to mix by hand with just a balloon whisk. I baked the bread at 350°F in 8 1/2 x 4 1/2-inch pans for about 40 minutes. It smelled wonderful — deep, rich, spicy. And it came out looking pretty much like the picture in the book. I let the bread cool before cutting it. And when I did slice into it, I was surprised by the flavor. As I mentioned above, I was expecting it to taste almost like chocolate cake. But it was not nearly that sugary. It had a rich, chocolaty flavor, to be sure. But it wasn’t fudgy or overly sweet. And the depth of flavor also came as a surprise. 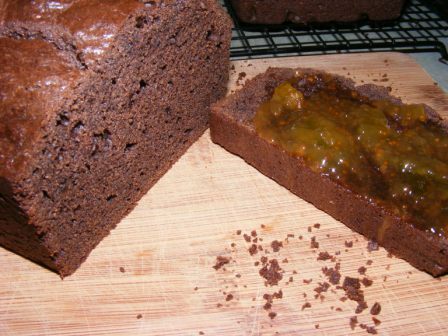 The spices, dark brown sugar, and sour cream, along with the Dutch cocoa and other ingredients, make for a complex bread with a taste that lingered after I had finished eating it. In the recipe, Nick Malgieri suggests that this bread is good with preserves or jam. Again, I wasn’t sure how that would be, as I expected the bread to be quite sweet on its own. But after tasting it, I could see how it might pair well with jam or jelly. I tried it with several spreads and found I really liked it with fig preserves. All in all, I was as pleased as I was surprised by this bread, and I will definitely make it again.